So, leading up to this workshop I took 45 minutes out of my day and did something that I think may very well be the culmination of what I have been working towards over the last two years. After asking Liz to go out and purchase a domain for $8.95 a year, I was able to use the Multi-Site Manager plugin to clone the settings of UMW Blogs within our install (think of it as a WPMu within a WPMu) and voilà, Longwood Blogs was created—it took all of two minutes! The other 43 minutes I spent playing with the theme and reproducing all of UMW’s customized support documentation for Longwood with the wonderful Wiki INC plugin—which allows us to not only reproduce our installation and host it for them, but also reproduce all of our documentation using a Mediawiki –>WordPress plugin! Not bad for a two hour training session, eh? Two years worth of iteration and development given to Longwood in less than an hour. Now, if that’s not an economical solution for the hard times that lay ahead, I really don’t know what is! And the most important part about this experiment is that it’s easy, and there is no excuse for universities not to do this! It is imperative that we liberate ourselves from silos of campuses and schools, and start sharing our work freely with one another so that we can all benefit. Think about it, all the time and energy Longwood saves on framing, designing, and building their own publishing platform can now be dedicated to finding money to support faculty in imagining the possibilities of such a space. That is the real power of this model, the technology is both simple and simply a means, the fact that we are able to reproduce and share what we have done for others illustrates we chose the right platform—so now we can all reap the benefits! That is the point, we need to open this stuff up (and I mean open in its truest sense, not the Bb ad speak) so that universities can quickly harness and use the unbelievable power of the wide open web for teaching and learning. On top of that, since we can share these resources amongst several schools using the multiple databases to make the load easier, we can actually share posts and course resources across campuses that much easier. A truly inter-campus publishing platform. The question for me is: how can we afford not to do this? Ok, so here is my rational in the about page in Longwood Blogs, I think it more rationally and succinctly makes the case I am trying to frame here. This is an experiment to see how easy it would be for one university to clone their WordPress Multi-User installation for another. The impetus behind this project is that the University of Mary Washington already has a state of the art publishing platform that they designed and piloted over the last two years. This site is a full-featured instance of UMW Blogs, which is actually running off the same installation. 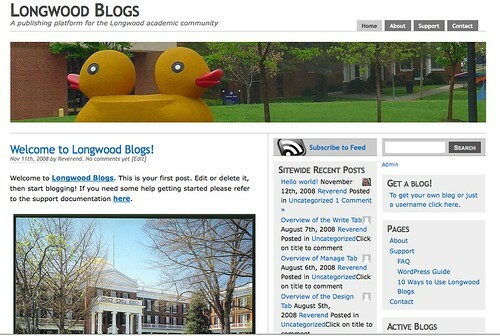 It literally took minutes to clone UMW Blogs’ settings and get this site up and running for Longwood University’s Greenwood Library. These two installations run off of the same base code, and hence the upgrades, backups, and additional functionality for both sites can be accomplished simultaneously. So, all the time and energy spent at Mary Washington to develop this environment can be quickly and easily reproduced and shared with Longwood at the low, low cost of a domain name, or $8.95 a year. What this does, in effect, is frees up time, money, and energy that would be otherwise earmarked for servers and web development, and allows universities to invest in people who will work closely with faculty to think about how they might harness the power of the internet for teaching and learning. During these hard economic times doesn’t it make sense to focus our attention to the human resources that truly augment teaching and learning rather than throwing money at vendors and proprietary black boxes? This entry was posted in UMW Blogs, wordpress multi-user, wpmu and tagged blogs, Greenwood Library, Longwood University, site mapping, umwblogs, wordpress multi-user, wpmu, wpmued. Bookmark the permalink. Now you’ve gone and done it. You’ve let people know how easy it is to share the best of what we build. This is the beauty of working within a well-architected system: it can be replicated quickly and easily, and can include content, configuration, and documentation. The short answer to your question: There is no good reason institutions should not do this. Keep on making magic here on the Bava. Thank you, and between your new Drupal aggregation blog, which is very sweet, there is no one way to do this. But it can be done well and affordably with so many of these ope source applications. And it works because of community members like you that share both your conception and execution of these possibilities so freely! Complete content management system for 8.95 a year of which you have full ownership and customization. The revolution shall be blogged, Edupunk z up in your sht Bb. Brilliant! Just brilliant! You’re such an innovator – I love it 🙂 I started writing my thoughts on this as a comment but ended up on this long reflection that wound up on my blog instead. I’m not sure if this blog supports trackbacks – if it does there should be one coming through shortly. Jim Groom is the WPMU God and he is doing miracles everywhere. I am right down the street at Fredericksburg Academy. I would love to talk to you about this (not that I am asking you to duplicate your efforts, more that I need to understand the concept). Do you have any time for a visit in the next few weeks? Your comment made my day week. That is exactly the idea behind this post: to share this stuff out so that we can, as a community, help each other frame an online publishing environment that will allow us to focus on the teaching and learning through the technology, not become slave to it. So, in short, I would love to visit some time next week. I will contact you directly, but thanks for the comment here—it epitomizes the logic of what this work should be about. 1)How much do people pay for server space. Although sharing with one smaller University is fine… what about sharing with 10? Or 20? Your server will be brought to its needs. 2)The institutions or departments ¨piggybacking¨ don´t really have full control. They can´t go in and easily add themes or plugins. Customization and ownership stops for them at the WordPress UI. 3)How do we truly share development? What happens when you come up with a radical idea to improve UMW on the back end but the other institution doesn´t want to do it? All of these concerns have pushed us to take a different model in our approach to sharing. We are busy working on making every aspect of our development easily accessible from the main blog site, everything from plugins to ways to make the database run better.That way others can easily copy what we have done, but without exposing us to the risks of actually hosting them ourselves. That being said, we´ve already been burned by synchronization issues… us updating something critical and the ¨piggybacking¨ department not doing it leading to crisis. I think there’s something about the Thanksgiving time of year that inspires reflection about the bigger picture — perhaps it’s because we’ve all had a few months of the academic year to put our summer plans into place, and reflect upon them. But Jim, your post is impeccably timed, and Andre’s contribution above is another important aspect to consider. I’ve been considering setting up some documentation about how to replicate the various pieces of a distributed blogging platform to support a variety of course blogging exercises — think of it as blog meets portfolio meets curriculum authoring environment, with users dropping their content into (and out of) the institutional infrastructure. The various authoring environments (aka blogs) can come from anywhere. With tools like Pipes, and the various syndication and embed structures we’ve all been discussing, moving content is becoming easier and easier. And this allows us to break our system into multiple pieces, with only some of these pieces (ie, the central aggregation site that collects the various feeds for courses) needing to under the direct control of the institution. I’m glossing over some significant details here, but the gist of what I’m saying is this: a decentralized structure, with clearly defined points of contact, will be easier to set up and maintain because no single piece will need to bear the brunt of the load. Can these systems scale? Yes, absolutely. However, the myth of the enterprise needs to be fully exposed here. No one system needs to do it all, and using the FUD of “it won’t scale” as an argument for not trying is pretty stale feed. So, you want to go in on documenting the tips and tricks that make these types of systems possible? More importantly, how much of this documentation is already written and can be repurposed with this goal in mind? 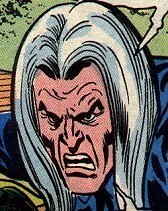 Now if I just knew someplace where I could set up a wiki.